Malaga, with its large international airport, is your gateway to Andalusia. Located on the south coast of Spain, Malaga is well connected by bus and train to cities such as Seville and Cordoba and the many popular beach towns along the Costa del Sol. And the closest of Spain's Best Cities to Malaga is Granada. Malaga may be the gateway to the south of Spain, but remember you don't need to spend too much time at the gate! You don't even need to go all the way into Malaga as there are buses direct to Granada from Malaga airport. There are regular buses from Malaga to Granada, departing every hour or half hour. The 9 am bus will get you to Granada for 11 am. Book your tickets to the Alhambra in advance - there are often long lines to get in which could seriously limit what you can do on a day trip. Book a morning visit and take a taxi straight from the bus station to the Alhambra. For lunch, make sure you go for tapas - Granada is famous for its free tapas culture. Then spend your afternoon exploring the Albayzin Muslim quarter. Then catch your bus back to Malaga in time for dinner. Considering visiting Malaga as a day trip from Granada? There are far better day trips from Granada than Malaga. A day is a little short for getting the most out of visiting Granada - I would recommend at least a night's stay. Granada is a more interesting city than Malaga and if your vacation is about visiting these two cities, you should definitely divide your time in favor of Granada. 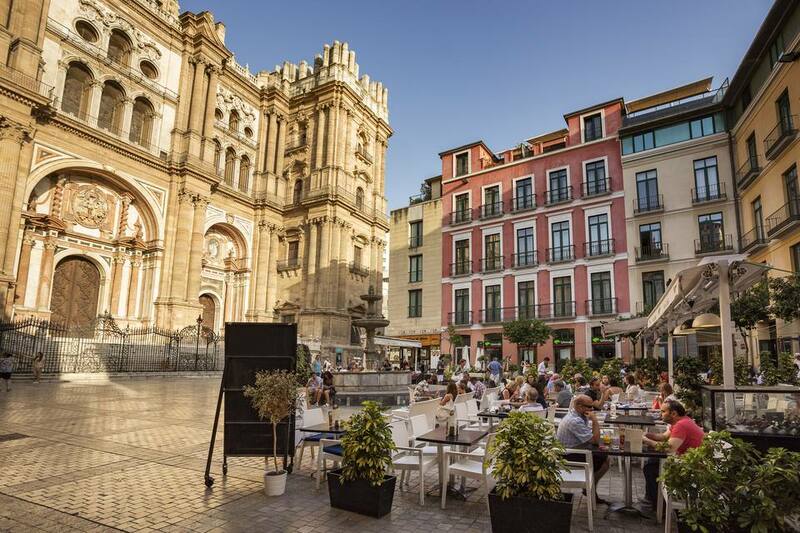 However, if you want to explore other cities in Andalusia, Malaga makes a better base - particularly for visiting Cordoba: the two cities are connected by the high-speed AVE train. Aim to stay close to Plaza Nueva for good access to all the sights in Granada. Check prices on hotels in Granada on TripAdvisor. The best way to get from Malaga to Granada by public transport is by bus. There are regular buses throughout the day. The journey takes two hours and costs about 10 euros. Book Bus Tickets in Spain. There are no direct trains to Granada from Malaga. If you really want to take the train (maybe you have a rail pass), you can transfer in Antequera, but there's a long transfer time and the train station is far from the city center so you won't even be able to get out and explore. Book Train Tickets in Spain. If you want to do a day trip to Granada, a guided tour from Malaga is a good option. This Granada Guided Tour from Malaga picks you up in the morning and takes you by air-conditioned coach to Granada, where you'll have a guided tour of the Alhambra and surrounding area, followed by free time to explore the city by yourself. The time you'll save by jumping the line to the Alhambra is worth the price of this tour alone. If you were planning on going to Granada on the way to Madrid, you might prefer a guided tour between Costa del Sol to Madrid, which takes you from Torremolinos (20 minutes from Malaga by train) to Madrid in two days, visiting Granada and Toledo on the way. This tour is especially good if you had wanted to travel from Granada to Toledo, a journey that is virtually impossible by public transport. The 130km drive from Malaga to Granada takes about one hour 30 minutes, traveling mainly by A45 and A92 highways. Compare Car Rental Rates in Spain. Heading north from Malaga to Granada, the obvious choices are west to Seville or north to Cordoba and on to Madrid. If you've just arrived on the south coast in Malaga, there's not really much further you can go, apart from along to coast towards Almeria or the Costa del Sol. Of course, you can also head to Morocco.